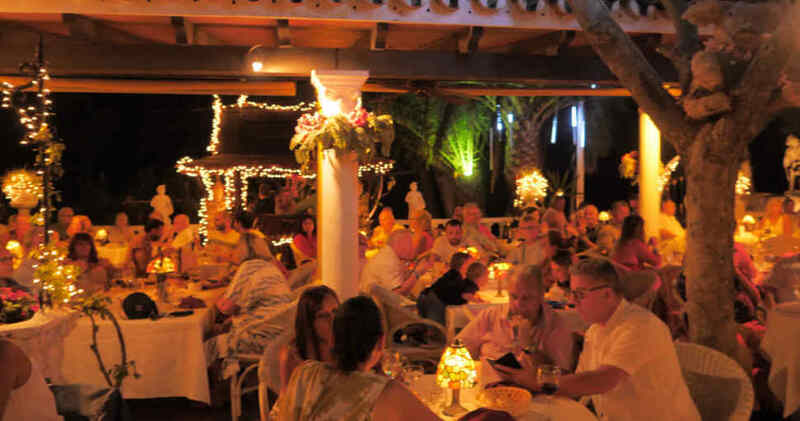 The Roman Oasis Restaurant is set in the Manilva countryside just three kilometres from the Costa del Sol and was named after the nearby Roman Baths. In this tropical atmosphere you can dine under a canopy of stars where flaming torches, twinkling lights and romantic background music all combine to create a special atmosphere in this enchanted place. Since its creation in 1983 this unique and exotic restaurant has served its fare of hearty food from the wood burning oven and barbecues and our years of experience, attention to every detail and our attentive staff ensure a memorable evening. Enjoy one of our special cocktails while perusing our menu of barbecued specialities and extensive wine list. Children will love our politically incorrect, but secure, adventure area (complete with skeleton to frighten the little darlings) where they will be seen but not heard!! Good news, too, for grumpy adults. After all this there is a mouth watering selection of desserts to tempt you, Irish coffee, Stilton cheese and a renowned port list of one hundred different ports. Phone or email us at the numbers listed below for reservations.